Would you like to join our friendly choir? Malmesbury Singers are always on the lookout for new members to join its 70-strong mixed voice classical choir. We offer a 50% discount on subscriptions for members under the age of 25. 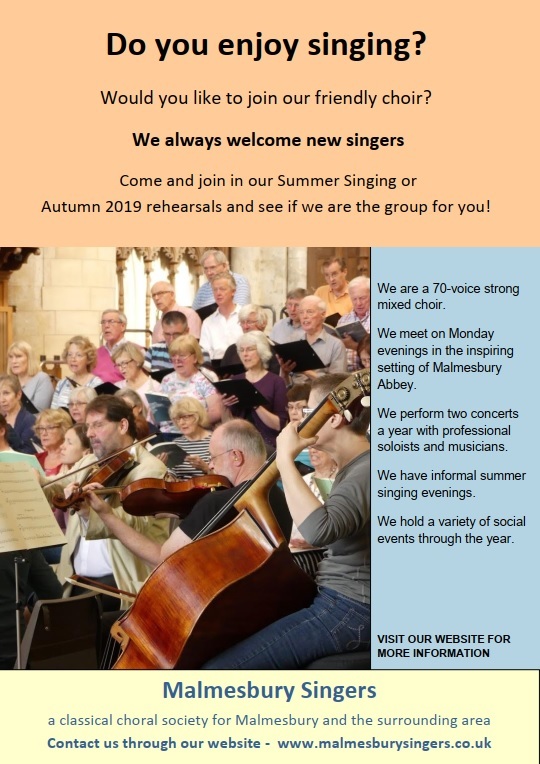 We rehearse on Monday evenings in Malmesbury Abbey and perform two concerts a year with professional soloists and musicians, as well as holding informal summer singing sessions, singing days and social events. Come and join us in Malmesbury Abbey on Monday evenings from 7.30pm! Our term resumed on Monday 7th January but if you are keen and an experienced singer, we would be pleased to hear from you. Please use the contact link below to get in touch!